Starting ten years ago at Bergenhus, the borough of the city, The Bergen Wood Festival for the second time took place in the centre of the city. There could be no doubt that this setting is an ideal complexity for the constructions as well as it is a challenge for the urban context. The city is a dynamic space, the social context, behaviour and rhythm of time are parameters that constantly are considered. This makes the interference and adaption of the international wood festival to the urban scheme of Bergen to an inspiring and valuable experience for the presence of architecture and wood. The work to find concept, conflict and construction in linear wood 2”x2” surely becomes a pedagogy that challenges craft and strategy to enter the city space. Throughout the festival the dynamic of building, sounds of hammering, cutting and wining tools encounter everyday life and celebration. The wooden festival is a story in itself almost literary “dancing in the streets” twisting Egyptian and tripping Estonian. Intricate exploring cross woven lines as shells and bowls of wood. Though the effort to comment may be short in time there is no doubt about the concern for global condition. Reciprocal and interdependent, sticks of wood are connecting and many stories can be told that enriches the general experience of intensity and performance. This project seemed at first like parts from a factory, but it was clear that the parts would come together in some way. This starting point did not prepare for what came. a quite wild composition, both on the ground and not. The forms twist and bend into an expressive object. Seen from one end it could be a ship. From the side, a dinosaur, or it could even look like a larva, meandering about. The jury likes the way this object grips the area around it, and dominates it. Also its many variations of shape make it exciting. 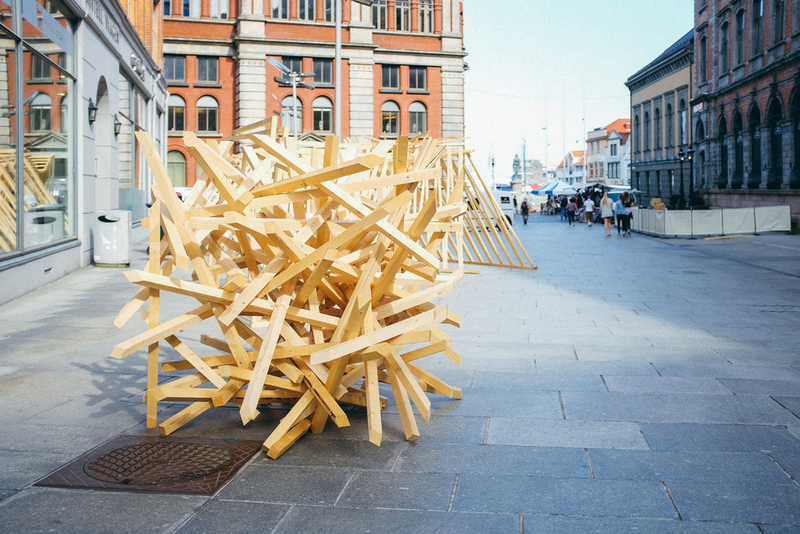 The project forms two large vertical walls of sticks 4 by 5 meters. Between the walls, a rolled, curved surface is established by sticks between the verticals. Also between the sticks a floor is raising a curved walkway with narrowing and opening spaces. The jury have particular selected this project for its ability to interact with the buildings and streets of the town in scale and form, and find the wood is well used to supplement architectural qualities of the townships. The project uses only small bits of wood screwed together at two points in ever changing directions, and then forms a special 3 dimensional chaotic - non euclidian solid. The chaotic solid is cut into a virtual 1.5 meter cube. The cube as one of the basic platonian polyhedron, shaped by cutting in the chaotic space makes an interaction in the small object, on a philosophic as well as on an aesthetic level. Although the participants’ title “Fridag” in the Scandinavian languages may refers to just “random mess”, the solid itself makes a very formal statement between two totally different geometrical ways of understanding special form. This is the main reason for the jury’s choice. “Tanura Dance” gets a honourable mention for the rich and constructive combination of material and image. Though this entry is a convincing image it would have been preferred to have it exposed in a further elaborated craftsmanship. The daring constellation and confrontation of material and the abstraction of the theme is well performed.